Fully engaged and motivated employees are a necessity to the success of any business. Covering all eight Striving Styles, this comprehensive book is invaluable to anyone involved in selecting, managing or developing employees, as it explains what drives behavior in employees and how to maximize their potential. 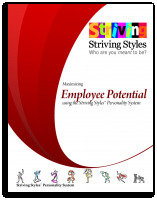 The Employee Profiles of each of the Styles helps managers and the employees understand individual talents, unique abilities, stressors and needs. Do you want to: Improve the effectiveness of yourself and your employees? Retain more employees and attract new talent to your organization? Order our Maximizing Employee Potential Report Today! Based on 30-years' experience working with leaders, teams and employees in organizations, this report provides a collection of insights into predictable employee behaviors for each of the Striving Styles, as well as what they need in order to be more successful in their role.